When to Update Your Kitchen Appliances | 41 Lumber - Serving Iron Mountain and the U.P. You will need to carefully consider whether or not you are making a kitchen upgrade for personal pleasure, or with the more specific aim of increasing the value of your home. When upgrading your appliances, remember that not all buyers will be ready to pay top dollar for innovative gadgetry: installing a $10,000 stove does not necessarily increase the value of your home by that amount. Take stock of general trends in your neighborhood, and keep within that range. Focus on products that perform well with universal appeal (such as dishwashers with noise-reducing features). Stoves, dishwashers and refrigerators are also huge culprits in driving up utility bills, so most buyers will approve of more eco-friendly models. The kitchen is the heart of the American home, and will only work as well as its weakest appliance when it comes to preparing meals, so performance should be first and foremost of your considerations. When your refrigerator stops cooling your food, it is probably time to update (common sense should be kicking in here!). Appliances are also among the top factors that will date your home, so the look and feel of the machine is important as well. A white 1970’s ceramic dishwasher will not bring as much value to your kitchen as will a stainless steel one. In fact, surveys have shown that the value degrade of older appliances is much more significant on future buyers than the value added by installing fancier, high-end appliances. The color of your appliances can often be the biggest clue-in towards their age. Beige or brown appliances have completely lost their appeal in a modern market, and black appliances are typically favored over white options. 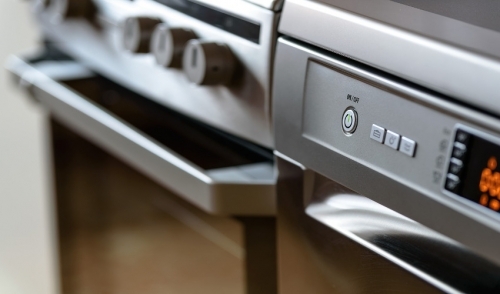 Stainless steel, however, still reins the market (however, an increasing number of buyers point to the annoyance of having to clean off fingerprints). Colored models are a fresh way to add color to a kitchen; jewel tones such as a deep purple or red are popular for this option, though more uniquely colored appliances still account for under five percent of manufacturer’s sales. If replacing your appliances is out of your budget range, there are short-term ways to upgrade. Most manufacturers sell doors for older appliances, so call to investigate whether or not changing the façade of your machine is a possibility. Many dishwasher panels are also white on one side and black on the other, so a few screws may be all you need to change the face of this appliance. In sum, updates should happen under one of two circumstances. If cooking is a hobby, by all means choose the appliances that will bring you happiness and enjoy that delicious home-cooked meal! If you are looking to make an investment, the kitchen is where you will recoup the most value over any other room—if you do things right, you can see up to an eighty percent return on your money!